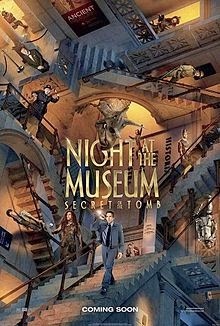 Night at the Museum: Secret of the Tomb is an upcoming 2014 American comedy film directed by Shawn Levy and written by Robert Ben Garant, David Guion, Michael Handelman and Thomas Lennon. It is the sequel to the 2009 film Night at the Museum: Battle of the Smithsonian. The film stars Ben Stiller, Robin Williams, Rebel Wilson, Ben Kingsley, Dan Stevens, Owen Wilson, Skyler Gisondo, Steve Coogan and Ricky Gervais. The film is scheduled to be released on December 19, 2014, by 20th Century Fox. It is the third and final installment of the trilogy. It will be Mickey Rooney's final film and one of Robin Williams's final films, as both of them died before the film was released.